I sometimes question John McCain's drive to be President. Sometimes it seems he doesn't have his heart in the race. Remember what I said back in July? I'm no pundit and even I figured out McCain's problem. He's too slow. While Senator Obama and Senator Clinton raced to the finish line of the primary season, John McCain had three extra months to raise funds, refine his strategy, and begin vetting running mates. He had April, May, and June. And what happened? He wanted Joe Lieberman or Tom Ridge to be his running mate. But one or more members of his campaign steered him to Sarah Palin in August. 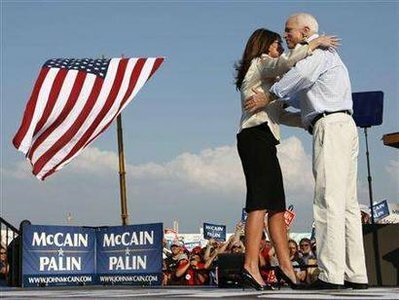 Now for the bombshell: McCain aides have admitted to the Washington Post that while Palin spent hours on her paperwork (tax returns, VP questionnaire), the actual 3-hour in-person interview with the McCain campaign did not occur until Wednessday August 27th - the day before Senator McCain asked her to be his running mate. Alaska Gov. Sarah Palin was not subjected to a lengthy in-person background interview with the head of Sen. John McCain's vice presidential vetting team until last Wednesday in Arizona, the day before McCain asked her to be his running mate, and she did not disclose the fact that her 17-year-old daughter was pregnant until that meeting, two knowledgeable McCain officials acknowledged Tuesday. Here is Maddow, Matthews, O'Donnell, Buchanan, and Robinson and when the story broke. I just got off the phone with the very helpful city clerk at the Wasilla City Clerk’s office, Kristie Smithers, who is pulling some documents for me from when Gov. Sarah Palin was mayor. I told her I appreciated her help, since I’m sure she’s been bombarded with requests these last few weeks. The clerk’s office keeps all City Council meeting agendas, minutes, legislation, ordinances, etc. She chuckled. Then she told me that I’m the first person who has asked her office for anything.